At Spa Lindos, our goal is to take your stay in Lindos to the next level of escape. 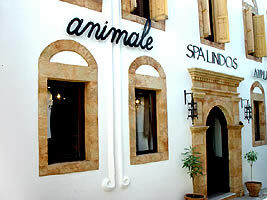 We offer a wide range of grooming, pampering and relaxation for both men and women. Whether you come for an express treatment or a five hour "Day of Relaxation" you will feeling refreshed and rejuvanated. All of our spa services use Dermalogica products which are aromatherapy blends carefully formulated for maximum results. Our clients deserve only the best. We also feature a full retail selection of bath and body products and a full line of men's and women's clothing and accessories .